I am learning a lot of new things gardening in a new state. Including something recently. I really like growing peppers, all kinds, I think they’re relatively free from pests and diseases (especially hot ones) and we eat a lot of peppers. Bell peppers are one of the few vegetables neither kid complains about. So I planted a lot of peppers this year, and they grew well, but I’ve had crap for yield, they keep rotting on the plant. They’ll get this spot, and it’ll be yellowish white, then it’ll turn more white, and then it’ll get bigger and bigger and bigger. It looked to me like some sort of fungal infection. I finally looked it up, this isn’t a pest or a disease, but the effects or heat and direct sunlight. In Michigan we always worried about peppers getting enough heat and sunlight, apparently here in Tennessee-almost-Georgia its the opposite. 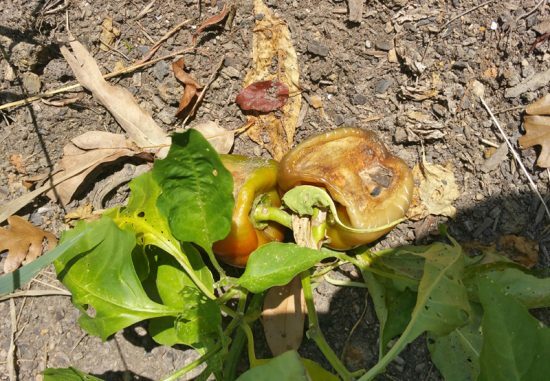 Too much heat and too much direct sun causes the flesh to simply get scalded away, and then it does become an avenue for infection, and the fruit rots. I was glad to find out the cause wasn’t going to require fighting another infestation, but I’m not sure a good solution. The leaves need sun to develop large fruit, but the fruit needs to be as shaded as possible. Fruit socks anyone? This also happens to tomatoes which explains why I had these whitish gashes on them as well. Although for those, since I basically make sauce with all my tomatoes, I just cut off the damaged portion and still used them. It is probably extreme this year. Last year around this time it was far more rainy and cloudy down here. This year we’re in the midst of a drought and rarely even have an overcast day, let alone rain. We’ve had one overcast day, the only one with rain, in the past 4 weeks. Lots of plants are dying, trees are dying, the drought stress is significant. I’m keeping my finger’s crossed for rain tomorrow, it is in the forecast. In the meantime I will water my peppers and maybe try moving them (many are in containers) to where they get morning sun but afternoon shade. I had the same thing here in Texas. All of my bell peppers looked like the ones in your picture. Now that the temperature is starting to cool down, I have a huge second crop of peppers growing! No sun scald this time. Good luck! Moving to morning sun only sounds like a good idea. We have the same problem in Kelowna with the grapes. I wish I could send you some of our rain! I’m sorry to hear about your peppers; there’s nothing more frustrating than a poor yield after all that work. I’ve never had this issue, though the garden is in full sun most of the day, but over the past few years I’ve grown my bell peppers next to my okra and eggplant, and the pepper plants tend to do well. After reading your post, I wonder if it’s because of the shade the eggplant and okra provide? I lost a lot of peppers and eggplants from sun scald this year in my aquaponics system. Never seen sunscald before. I live in the northeast and it’s usually not that sunny here. I’ll be sure to keep an eye out for it in the future, though. I had the same issues with my peppers once and it wasn’t sunscald. If you are amending your soil with compost or organic raw materials you could be over doing it. If you are amending let your soil balance itself by not amending a season or two, till soil in the fall to oxygenate and help breakdown any organics still present. When bacteria levels get too high any fruiting garden plant will have the same response. Never turn your garden into a compost pile no matter what u tube says. Even with finished compost you must be careful, safest too apply in fall and till in and let winter. If applying directly to plants use small amounts. mine is definitely sunscald – the spots were right where the peppers were unshaded by leaf cover. We used to see this all the time. Really sorry to hear you have been affected by this. It’s so painful when you’ve waited ages for them to grow and see them get to this state. Ideally you need to get a handle on the the shading you have on them throughout the day particularly if they are fully exposed at mid-day. 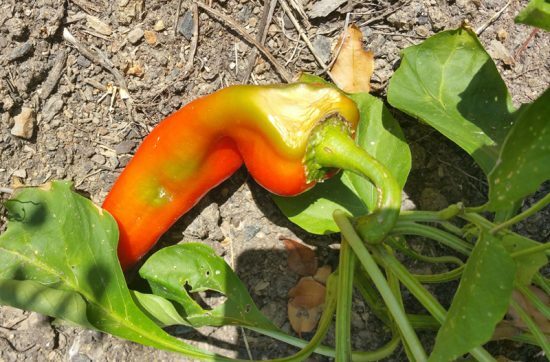 When sunlight hits the pepper it doesn’t just eventually cause white rot but it can also change the colour of the pepper significantly which can sometimes alter the taste depending on what pepper it is. It’s best to check on them every few days if you can. Hope you’ve not been too badly affected. I have found that they like growing fairly crowded together so that sun shines on the top (canopy if you will) of the pepper patch but not on the ripening peppers down below. I realized that wild peppers are riparian plants in arroyos or streambanks in hot desert-like areas. So they had sun coming down at them but banks or other plants to the side of them. Along the edges of the patch, I like to grow basil, which is busy and sun-loving enough to be the sun buffer for those peppers on the outside plants. The streamside habitat explains their love for loose well-cultivated soil as well. I find that they are one of the few vegetables that seem to grow better for me in a potting soil in a container than in the ground.